We find that people are often obsessed with core exercises. I personally think they are important but for different reasons than slimming down the waistline, because that is the one thing core exercises don’t do. Do Core Exercises slim the waistline? If you do a lot of crunches, rotational exercises, or the combination of these two, the last thing you will do is slimming down the waist. Besides, the fact is: there is no spot-fat-reduction possible, training abs the way mentioned above will lead to muscle hypertrophy which in result in the muscle to thicken and instead of a thinner waist, you end up with a bigger one. Another aspect that needs to be considered is the actual functional application of what we are doing. 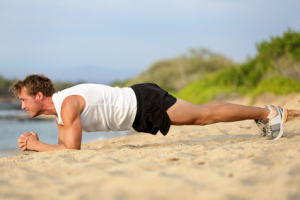 Our core muscles usually don’t lift heavy weights (your trunk during crunches, etc.) while flexing or rotating the spine. Usually the core muscles in your back and abs work together to prevent rotational forces to turn your body, or to maintain posture in an upright position resisting a load, more so than flexing and bending. Crunches, etc can put a lot of stress on discs. If you already have issues, crunches might be the last thing you want to do. The pallof press is a great exercise that strengthens your core. It does not only work your obliques, but a host of your hip and back muscles as well. We are teaching the pallof press in a “tall-kneeling, half-kneeling, or standing” position, with “tall-kneeling as the beginner’s stage. It is crucial that both arms stay straight, the shoulders packed and the body in alignment. We have people hold the outstretched position anywhere from 10-30s three times in a set. The key is to maintain form. The next exercise works the anterior core (straight abdominals, transverse, but also obliques), the roll out plank on the ball. It is important to maintain a neutral spine throughout the exercise. The elbows are positioned on the ball and slowly roll forward. This movement increases the leverage and you will feel your core work more intensively right away. For both exercises we make sure that our clients breathe throughout them consistently and deeply. We avoid shallow breathing and focus on deep diaphragmatic breathing. We all include these exercises into our routines once a client is capable of performing them with good form.